Defender Kyle McAusland has joined Dunfermline after having his contract paid up by Rangers. The 21-year-old had been on loan to Brechin City since September and scored three times in 11 appearances for the Scottish League One side. 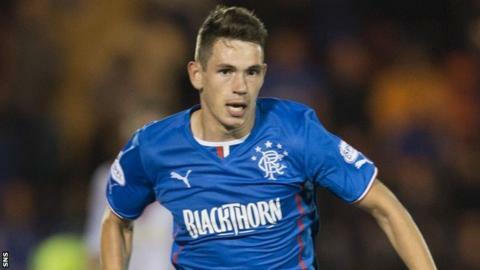 He returned to Ibrox on 27 December and Brechin boss Ray McKinnon had hoped to bring him back for another loan spell. But McAusland has opted to stay full-time with the Pars, who trail Brechin by two points. He had previously been out on loan at Ayr United on two occasions, playing more than 40 games during that time. Dunfermline recruited striker Andy Barrowman earlier this week, with midfielder Ross Forbes leaving East End Park. Barrowman, 30, returns for a second spell at the Fife club, having scored six goals for Morton this season, while Forbes, 25, goes in the other direction.